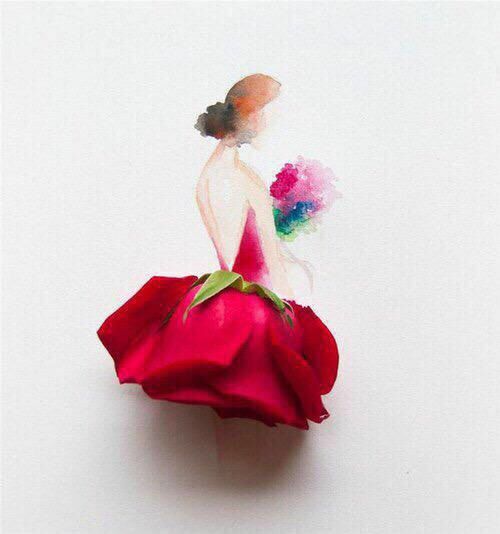 Do you really think you have chosen that red dress you've bought last week? I have to surprise you, you did not. Let me explain you a "trend forecasting". Red, especially red dress was becoming the "it dress" for quite a long time. 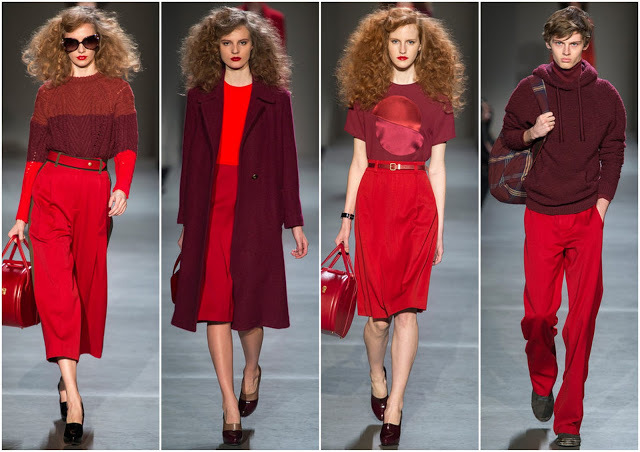 Everything starts when for Fall 2013 Marc Jacobs in his younger and more edgy line, MBMJ presented different shades of red, from wine one to bloody one, worn head to toe. That season similar silhouettes proposed also Dolce & Gabbana, Valentino and Christopher Kane. 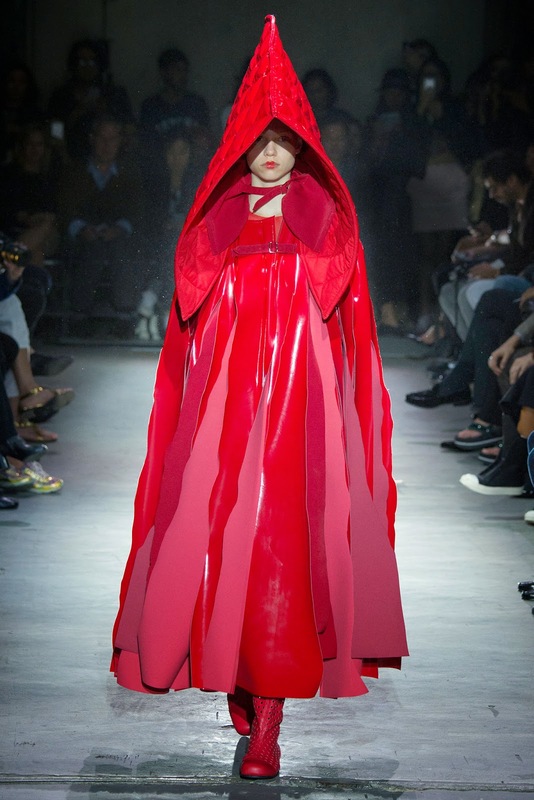 Then for Spring 2015 Rei Kawakubo from Commes des Garcons proposed her version of "Little red riding hood". Fall 2015 belonged to the red lace. From Dior to Marni, Fendi to Ferragamo, every designer was working the hue in head-to-toe forms. Overall it looked fresh and not tacky. 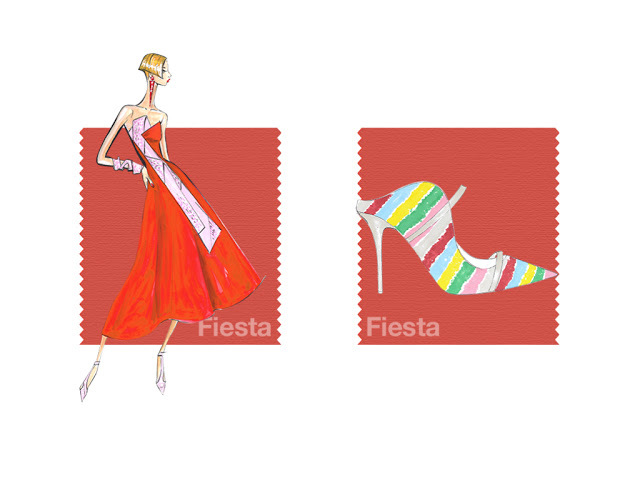 "A strong and fiery, yellow-based Red, the vivid Fiesta provided a stark contrast to the calming, softer nature of Spring 2016 palette", said Pantone in their yearly fashion color report. 2016, Golden Globe: Jennifer Lawrence matched the red carpet in a red-hot cut-out Dior Haute Couture column with a diamond Chopard bib necklace, while Emmy Rossumaimed for modern minimalism in a crimson-red strapless Armani Prive gown that she glammed up with diamonds and metallics. Natalie Dormer also matched the red carpet in her Victorian-inspired off-shoulder J. Mendel design, but it was Olivia Wilde and Zendaya who struck bold in darker hues—Wilde sparkled in a wine sequin-embellished Michael Kors Collection halter gown, while Zendaya was utterly romantic in a rose brocade Marchesa gown with tiered ruffles. 2016, Cannes Film Festival: Everyone lost their minds when Bella Hadid stepped on the red carpet at Cannes early this year, but I couldn't help thinking I'd seen the look before. As the Daily Mail points out, I sure had: singer Rita Ora wore an almost identical dress to the MTV Video Music Awards in 2014. After streetstyle usually come high street brands. 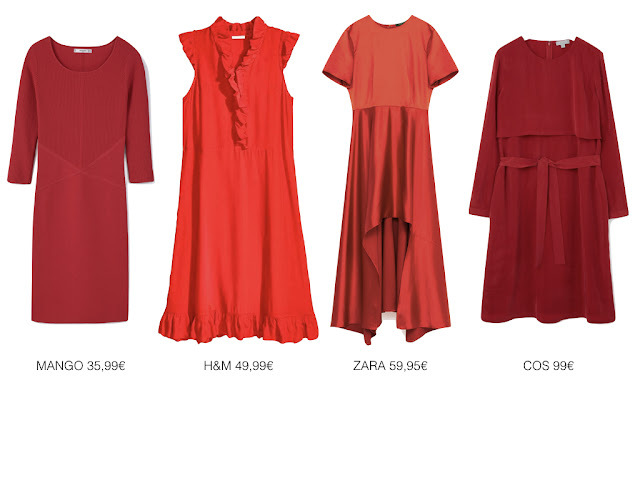 They identify key styles of the season few months in advance and assure "your" red dress appears in fashion magazine you read, on social media channels you follow and will be worn on celebrity you like. At the end is placed in the store exactly where you would you look for. Did you buy one from those? Coincidence? No, trend forecasting. A trend is what's hip or popular at a certain point in time. A trend simply reflects what seems to be going around at any given time. A trend can be in any area and doesn't only reflect fashion, pop culture and entertainment. Trend forecasting predicts the colors, fabrics, textures, materials, prints, graphics, etc. The concept applies to not one, but all levels of the fashion industry including haute couture, ready-to-wear, mass market, and street wear. Trend forecasting is an overall process that focuses on other industries such as automobiles, medicine, food and beverages, literature, and home furnishings. Fashion forecasters are responsible for attracting consumers and helping retail businesses and designers sell their brands. 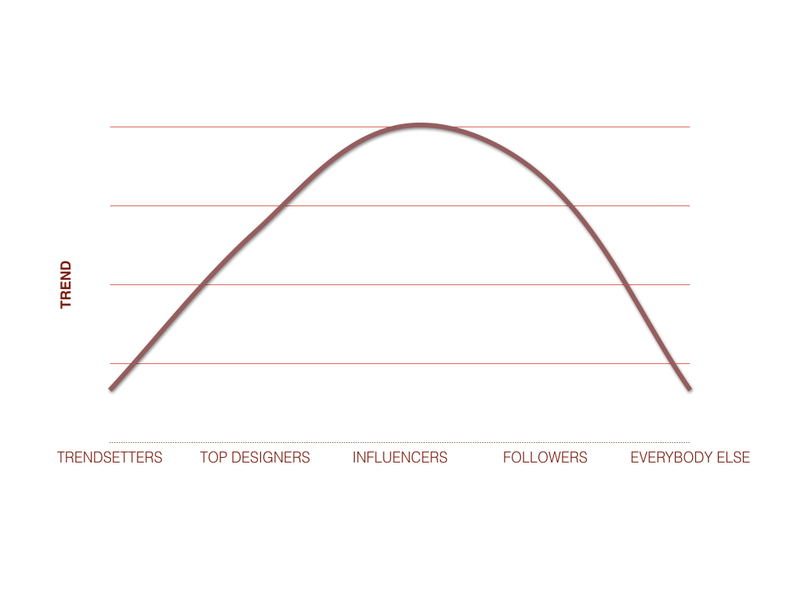 Nowadays borders between trendsetters, influencers and followers seems to disappear. It's hard to say who, where, when was first, however trend curve does not change so much. 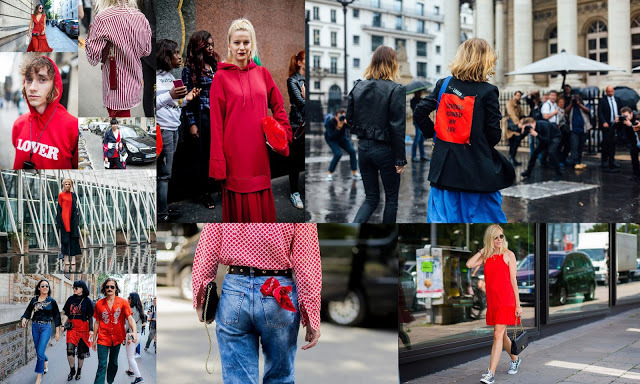 Yes, you can now observe trend "everything is fashion", but you can also easily see how many Vetements inspired outfits are out there, just waiting to be bought. So, do you still believe you choose your red dress?